Black satin finish with embellished flowers, beadwork and rhinestone. Perfect for those special occassions! CROCS Cyprus Criss Cross Slip On Brown & Tan High Heel Sandals Women's Size 10W. Shipped with USPS Priority Mail. VINCE CAMUTO Corlina Ankle Strap Sandal Pink Size 11M New In Box $99.95. Condition is New with box. Shipped with USPS Priority Mail. These shoes are in good condition. They do show some wear from normal use. There are some light scuffs. Item is as pictured. Please view all pictures and ask questions if you have any. I generally ship within one business day after payment is received. Thank you for your purchase! Length (heel to toe)-10.75". Shoes are like new and in excellent condition. Heel-3.25". Insoles-10.75". Width-3.5". CLARKS WOMENS BLACK LEATHER MARY JANE HEEL SHOES. SIZE 10 M. BUCKLED SHOE WITH DETAILED DESIGN AROUND RIM. LEOPARD PRINT LINING INSIDE. COMFORTABLE CUSHIONED SOLE. 3 INCH BLOCK HEEL. GENTLY USED, IN GREAT CONDITION! THANKS FOR LOOKING. Aerosoles Black Faux Suede Seesaw Mules Rubber Soles Slip On Size 10M NWT No Box. Style: Sassafras Mary Jane, Leather, # W31367. Color: Black. I bought for wedding, and chose a different pair at the last minute. New without box. Crocs Cyprus IV Women’s Black Heel Sandals - Size 10. Condition is in good Pre-owned. Shipped with USPS Priority Mail. Check pics for more details. Nine West Retro Inspired Heels. Shipped with USPS Priority Mail. Outside length - 10.5". widest outside width - 3.5". New Sam Edelman Circus Women's Ankle Strap Block Heel Sandal Size 10. New, never worn pair of heel block sandals featuring geometric peach/ periwinkle pattern. Shipped with USPS Priority Mail. 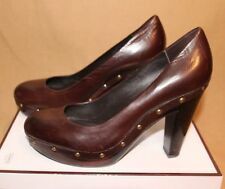 Maurice's Brown Penny loafer Slip on style platform pumps high heels Women's 10. Condition is Pre-owned. Shipped with USPS Priority Mail. Heel: 4.25". Manmade Sole. Leather Upper. Size: 10 M /40 EUR. I'll be happy to help. THERE ARE SCRATCHES/SCUFFS ON THE OUTSOLE. Made in China. Color: Gold. Size: 10 M.
DOLCE VITA Cobalt Blue Satin Henry Open Toe Block Heel Slide Sandal NEW Sz 10. Shipped with USPS Priority Mail. 4 5/8" block heel, 10 5/8" insole. Please email with questions prior to buying, no returns accepted, all sales Final. Thank you! Dolce Vita is a trademark of Dolce Vita. Tjmmfabuys is not affiliated with Dolce Vita. Women's Nine West D'Orsay Pump - Anisa9x9 - Navy/Gold Fabric - New!! $148 ANN TAYLOR Joy Black Suede Flower Heeled Slingback Sandals 10 NEW! 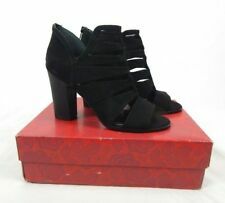 New without box ANN TAYLOR Joy Black Suede Flower Heeled Slingback Sandals. work the bloom, with petal-perfect detail at the toe. Our strappy suede sandals. Flower atop each toe strap. These shoes are so cute,durable and comfortable shoes. These shoes are super soft and beautiful! Color is a very pretty gray. Size 41 US 10.